The 73rd World Science Fiction Convention (Worldcon), also known as Sasquan, was held on August 19–23, 2015, at the Spokane Convention Center in Spokane, Washington. This location was selected on August 31, 2013, by the members of the 71st World Science Fiction Convention in San Antonio, Texas. The convention was chaired by Sally Woehrle. The Guests of Honor for Sasquan were artist Brad Foster, author David Gerrold, author Vonda McIntyre, filker Tom Smith, and fan Leslie Turek. 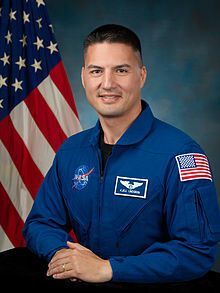 NASA astronaut Kjell Lindgren participated from Earth orbit as Sasquan's Special Guest while aboard the International Space Station. The first contested Worldcon selection since the 2007 vote for the 2009 Worldcon site saw active campaigning and drew celebrity endorsements. Authors George R. R. Martin and Cory Doctorow publicly supported the Helsinki bid and encouraged their fans to vote while artist Phil Foglio declared his support for Spokane's bid and artist Bob Eggleton declared his support for Orlando. Spokane won the site selection contest on the third round of ballot counting in Australian-style preferential balloting. Spokane finished with 645 votes, gaining a majority over Helsinki with 610. Orlando was dropped in the second round with 307 votes and "none of the above" had been eliminated in the first round. Boston, Minneapolis, and Locust Grove, Virginia, each received multiple write-in votes with Pyongyang and other hoax sites receiving single write-in votes. After the "Spokane in 2015" bid chaired by Alex von Thorn won the site selection vote, Sally Woehrle and Bobbie DuFault were announced as co-chairs of the convention on behalf of the Seattle Westercon Organizing Committee. DuFault died suddenly on the morning of September 14, 2013. The convention announced that Sally Woehrle would serve as chair with Glenn Glazer, Pierre Pettinger, and Mike Willmoth as vice-chairs. Of the 2,122 valid nominating ballots, 2,119 were submitted online and 3 on paper. The year's final ballot was dominated by slates organized as the "Sad Puppies" and "Rabid Puppies". The controversy brought international press attention to the awards process and caused several nominees to withdraw from consideration. However, only one slate candidate won an award, and in the five categories in which only slate candidates were nominated, no award was given. The Sidewise Award for Alternate History, normally presented at Worldcon, were announced online by Steven H Silver on August 17, 2015. Kristine Kathryn Rusch won long form for her novel The Enemy Within. Ken Liu won short form for his story "The Long Haul: From the Annals of Transportation, The Pacific Monthly, May 2009". The Sasquan masquerade was held in the First Interstate Center for the Arts (then known as the INB Performing Arts Center), on same campus as the Convention Center, in the evening of Friday, 16 August. There were 45 entrants competing for ten major awards. The Sasquan Masquerade Director was Sharon Sbarsky. Kevin Roche was the master of ceremonies and the judges were Brad W. Foster, David Gerrold, Sandy Pettinger, Kathy Sanders, and Syd Weinstein (additionally, the workmanship judges were Tanglwyst de Holloway and Michele Weinstein). Best in Show (workmanship): "Roll for Initiative" by Jonnalyn Wolfcat et al. Four committees announced bids to host the 75th World Science Fiction Convention and filed all of the required paperwork by the February 2015 deadline: "Nippon in 2017", "Montreal in 2017", "Helsinki in 2017", and "Washington D.C. in 2017". The 2017 site selected by the voters was announced during the convention's third World Science Fiction Society business meeting, on Saturday, August 22, 2015. With 1363 votes out of 2625 valid ballots, Helsinki won on the first ballot and will operate as "Worldcon 75". DC17 ran second with 878 votes, Montreal third with 228, and Nippon fourth with 120. ^ Sowa, Tom (November 21, 2014). "Spokane to host 2015 World Science Fiction Convention". The Seattle Times. Seattle, WA. Retrieved December 1, 2014. ^ a b Woehrle, Sally (September 15, 2013). "On Bobbie and Going Forward". sasquan.org. Retrieved September 16, 2013. ^ Silver, Steven H (September 1, 2013). "Sasquan: 73rd Worldcon". SF Site. Retrieved September 6, 2013. ^ a b Mitchell, Petrea (September 1, 2013). "Spokane Gets 2015 Worldcon". Con-News.com. Retrieved September 6, 2013. ^ Glyer, Mike (March 14, 2015). "NASA Astronaut Named Sasquan Special Guest". File 770. Retrieved April 4, 2015. ^ Fox, Rose (September 3, 2012). "Worldcon Breaking News". Genreville. Publishers Weekly. Archived from the original on September 26, 2012. Retrieved September 26, 2012. ^ "WorldCon Site Selection". San Antonio, TX: LoneStarCon 3. July 9, 2013. Retrieved August 19, 2013. ^ a b Glyer, Mike (October 30, 2011). "Future Worldcon Bids". File 770. Retrieved July 1, 2012. ^ Martin, George R.R. (August 13, 2013). "Finland, Finland, Finland". Not A Blog. Archived from the original on August 19, 2013. Retrieved August 18, 2013. ^ Doctorow, Cory (August 16, 2013). "Why vote for Helsinki in 2015 & come to Finland". YouTube. Retrieved August 18, 2013. ^ Foglio, Phil (August 13, 2013). "And Again We Are Back". Hey. Retrieved August 19, 2013. ^ "August 27 at 7:36am". Orlando in 2015. August 27, 2013. Retrieved April 4, 2015 – via Twitter. ^ Glyer, Mike (August 31, 2013). "It's Spokane in 2015". File 770. Retrieved September 6, 2013. ^ a b "Spokane Wins 2015 Worldcon On Third Ballot; Detroit Wins 2014 NASFiC On First Round" (PDF). La Estrella Solitaria. San Antonio, TX: LoneStarCon 3. September 1, 2013. Retrieved August 17, 2014. ^ Glyer, Mike (September 1, 2013). "Spokane Worldcon Announcement". File 770. Retrieved September 6, 2013. ^ Glazer, Glenn (September 14, 2013). "Bobbie DuFault". sasquan.org. Retrieved September 14, 2013. ^ Glyer, Mike (September 14, 2013). "Bobbie DuFault Dies". File 770. Retrieved September 14, 2013. ^ "2015 Hugo Award and John W. Campbell Award Nominations". Sasquan. April 4, 2015. Retrieved April 4, 2015. ^ Waldman, Katy (April 8, 2015). "How Sci-Fi's Hugo Awards Got Their Own Full-Blown Gamergate". Slate. Retrieved April 11, 2015. ^ "Hugo Award nominations spark criticism over diversity in sci-fi: Sci-fi awards have been roped into a furore". The Daily Telegraph. April 8, 2015. Retrieved April 12, 2015. ^ Rapoport, Michael (August 23, 2015). "No 'Puppy' Love at Science Fiction's Hugo Awards". The Wall Street Journal. New York, NY: News Corp. Retrieved August 24, 2015. ^ Dwyer, Colin (August 23, 2015). "Amid A Hubbub At The Hugos, 'Puppies' See Little Success". Washington, D.C.: NPR. Retrieved August 24, 2015. ^ Wallace, Amy (August 23, 2015). "Who Won Science Fiction's Hugo Awards, and Why It Matters". Wired. San Francisco, CA: Condé Nast. Retrieved August 24, 2015. ^ a b c d e Hertz, John (September 13, 2015). "2015 Worldcon Masquerade Results". File 770. ^ "Worldcon—Other Awards" (PDF). NASFA Shuttle. North Alabama Science Fiction Association: 5–6. ^ "Site Selection". Sasquan. February 19, 2015. Retrieved April 4, 2015. ^ "Worldcon and NASFiC Bids". Worldcon.org. February 16, 2015. Archived from the original on April 7, 2015. Retrieved April 4, 2015.